Fun fact for the kids: after we die, our bodies begin a natural mummification process. This process of decomposition basically turns body fat into a substance that resembles wax and has the properties of a kind of castile soap, encasing and preserving our remains. Now I don’t now about you, but I feel like since our lives culminate with one big soap-making DIY, I really think we should at least practice. 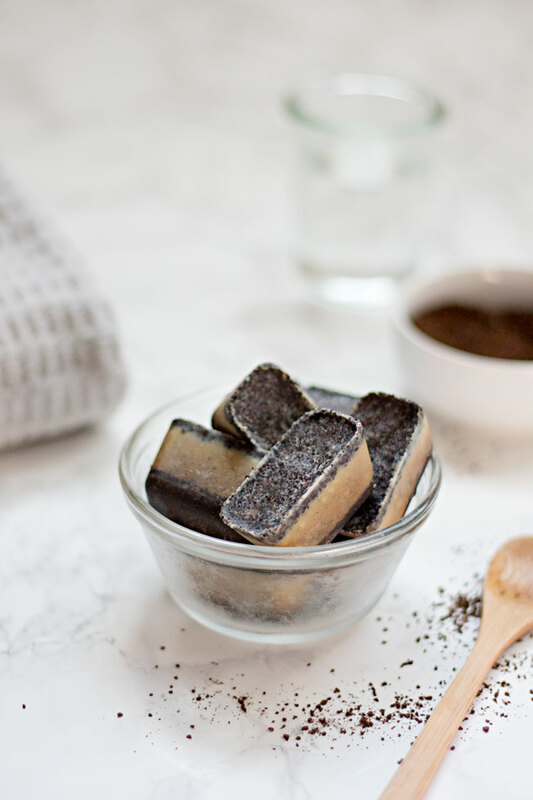 These exfoliating scrub bars are a good place to start. They’re super easy to make and even easier to customize. The basic recipe is oil+ sugar (or salt)+ soap base. You can take that basic recipe and completely customize it by the addition of essential oils and other ingredients. Oatmeal Eucalyptus, anyone? If you haven’t already, you really should invest in one of these silicon molds. They make all your homemade scrub bars look so legit. Of course you can always use ice cube trays, but remember we’re all practicing for the grand finale so just go ahead and put your best foot forward. I like to store my homemade soaps in glass jars like the Vardagen Jar from Ikea, but as long as they’re stored properly, these scrub bars will last a long time. So without further ado, here’s 2 of my favorite recipes! This combination from Burkatron is super refreshing! 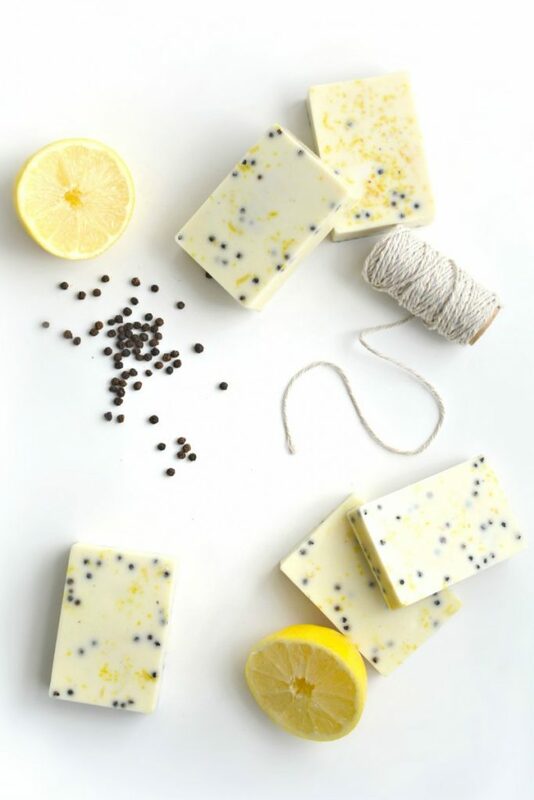 Peppercorn gently exfoliates, while lemon brightens the skin for a much needed escape from Winter skin woes. This super moisturizing combo from Hello Glow does wonders for dry skin. I absolutely love using ground coffee as an exfoliant. Trust me, your skin has never felt so smooth! Once you get the hang of making these scrub bars, they’ll be no stopping you! I’ve tried several combinations already, and I haven’t been disappointed yet. Here’s a few of my flavor combos, but if you know of anymore that I should make, definitely let me know in the comments! The older I get, the more I realize how dependent my mood is on the changing seasons. Winter always leaves me feeling bummed out and run down. The smell of firewood, peppermint, cinnamon, and cloves always makes me feel strangely nostalgic and sleepy all at once. I’m not complaining exactly. I kinda like the fact that my spirit goes into hibernation mode during the Winter months. It tends to make Spring and Summer that much more energizing. The smell of roses, citrus, mown grass, and the salty breeze from the Atlantic, always perk me up and make me want to live! 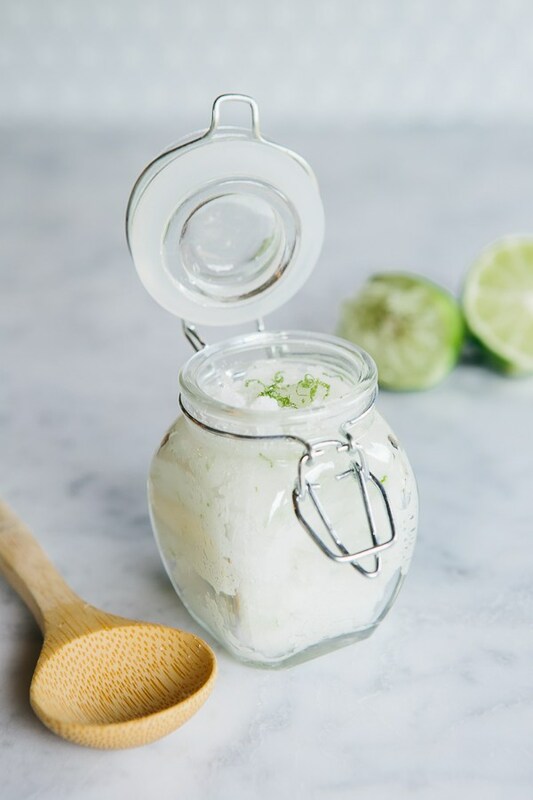 Over the weekend I made this amazing coconut lime sugar scrub just in time for Spring and Cinco de Mayo! This stuff is the real deal. 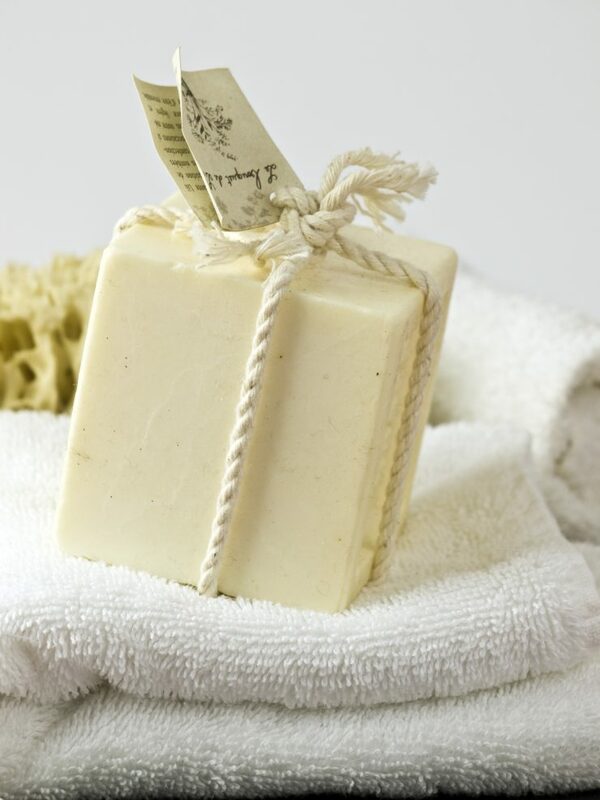 The fresh scent of lime is totally energizing and the coconut oil leaves your skin feeling super smooth. 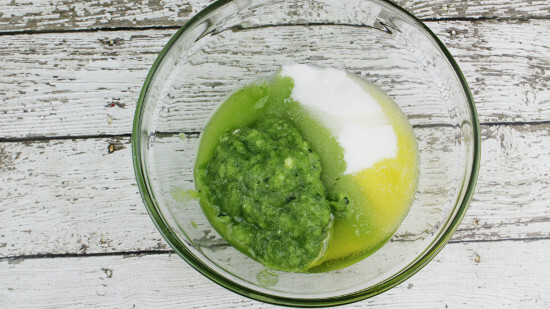 I use some variation of this sugar scrub every summer at least twice a week. This recipe makes a lot, so if you don’t need as much you can tweak the proportions to suit your needs. Happy Spring, you guys! 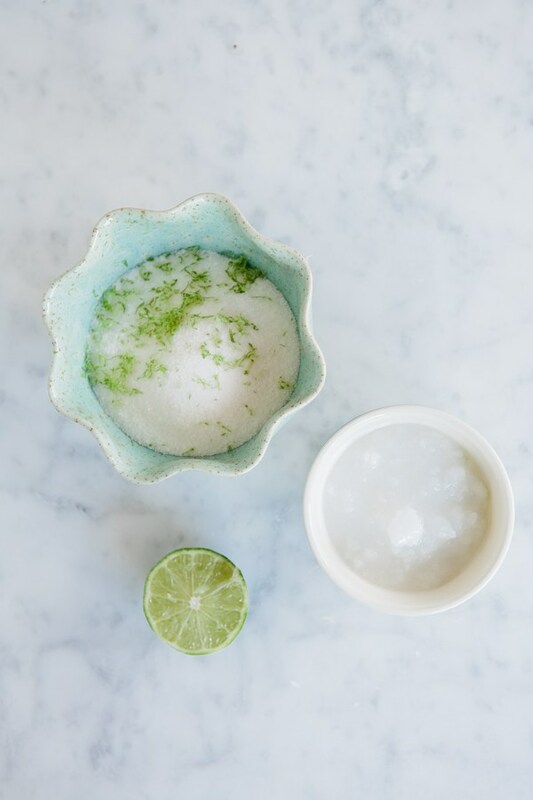 Combine coconut oil, sugar and lime zest. Mix until combined. Add 7 drops of lime oil and stir. If the smell isn’t strong enough, add more oil, 2 drops at a time. Store in an airtight glass jar (the jars pictured here are from Target). Happy, Happy, Happy Monday, you guys!!! I’m floating on a cloud after the Super Bowl and the Patriots’ amaaaaazing performance. Side Bar: I’m a Giants fan by birth, but a total Patriots fan since high school. Anyway, I’m obvs in a celebratory mood and I don’t know about you, but I like to pamper myself when I’m this happy…also when I’m feeling down…or like pretty much all the time. So yeah. I had to come up with another yummy spa day DIY for you guys. I’m missing warm weather like crazy, so the other day I made myself a carafe of cucumber water, because it always reminds me of summer in the city. 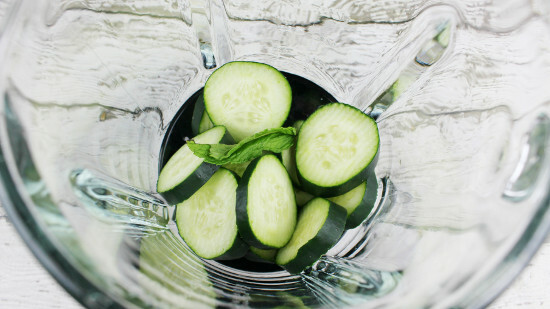 The first time I had cucumber water was back in the day when I used to spend a small fortune going to spas around the city. While you’re in the waiting area, they serve you drinks like mimosas or cucumber water. Fancy fancy. I usually passed on the mimosas and soon discovered that there is no beverage in the world as refreshing as cucumber water, and when you add a sprig or two of mint…Madonn! Anyway, you know how I like to smear food on my skin, right? 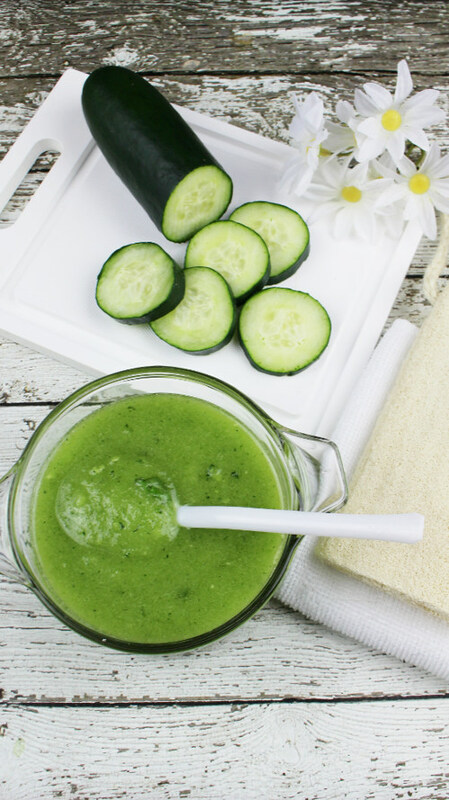 Well, I was sipping on this cucumber mint water while the Patriots were launching the greatest comeback in Super Bowl history, and I had the overwhelming urge to make the mother of all sugar scrubs. Thug life. You guys, cucumbers are the real deal. 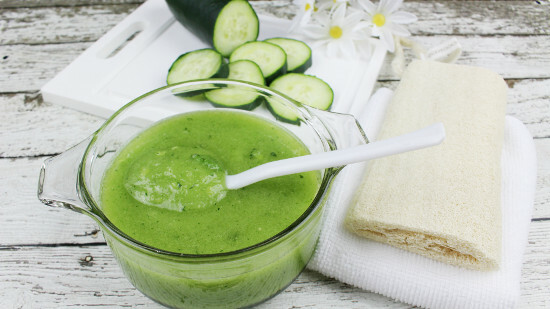 This Cucumber Mint Sugar Scrub is everything! 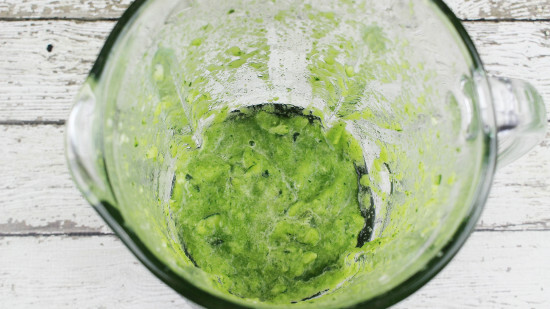 ***you can use a regular mouth mason jar instead of the blender carafe when you puree the cucumber. Your call. The mason jar is just more compact and easier to clean.